Deborah Mullan/A Creative Living Professional : Pi! Use one pie crust (or cookie dough, but that not low anything) roll it out and bake as directed. Don't forget to dock it or it will bubble on you. Top with well drained Greek yogurt in the flavor of you choice. 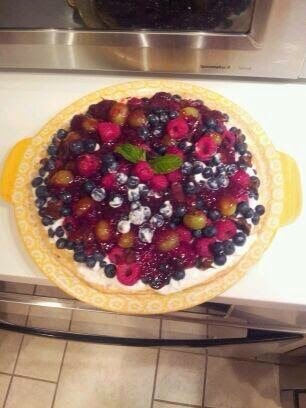 I like to use plain Greek yogurt and I put in fresh berries that I have cooked down and sweetened with Stevia. Mash the berries and put them in the yogurt. Mix well. Use fresh fruit to cover the top...make some great arrangement with the fruits of you choice. Melt jelly ( in the flavor of your choice) or use a gelatin to top your fruit pizza! It's great snacking or dessert.